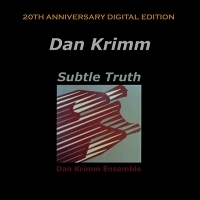 The digital release of Subtle Truth in 2011 follows twenty years after the initial release in 1991 on cassette tape. There was no physical CD manufactured for this EP album, though there was a digital stereo master created simultaneously with the analog master. This digital recording was derived directly from the original master digital data. 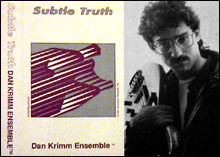 Subtle Truth was Dan Krimm's second, and at the time final, audio recording under his own name as a bandleader (the Dan Krimm Ensemble), via his self-owned record label, Overtone Records (decommissioned in 1993 -- the re-release is by Dan's new label: Another Pass Productions). This marked the culmination of his endeavor to break a career as a self-supporting musical artist, and in particular his efforts to stretch his technique into chording/comping roles in his group, as well as extending his improvisational range. Dan had become comfortable with the piano-less quartet format (sax, guitar, bass, drums) playing with guitarist Rolf Sturm in the late 80s, and ultimately gravitated to that format for his own group when he was ready for a second recording project several years after recording Sentience in 1985. This ensemble format provides more room for the bass to contribute in a variety of ways than a group with piano, with bass playing more melodies and chording. It was a natural choice to invite Rolf to join the group (and to include several of Rolf's compositions in the live repertoire). Percussionist Tom Nazziola was a respected colleague in the group Monkeyworks, and Mike Foster on sax was a connection via singer-songwriter Susan Fiering, with whom Dan had been playing for a couple years as well. Mike had been working in a free-improvisational mode for awhile and Dan was beginning to stretch further in that direction, so Mike's affinities in this area were pertinent to Dan's aspirations for the group. Tom also had compositional and arrangement experience to bring to bear on the music, and it was a goal that all members have compositional experience on their own merits. The concept of the group was to present mostly original works (about half by Dan and another quarter by Rolf and Mike) plus a few particular covers that provided an opportunity for arrangement along the lines of the group concept, which was to highlight the expanded role of the bass guitar, to perform works that explored fresh harmonic structures, and to stretch on occasion into hybridized forms of arrangement that combined well-defined tempo with more avant improvisational expressions. The four original compositions on Subtle Truth were all written in 1980-81, but three of them were first recorded on this recording (Spirit Dance was included in a slightly different arrangement on Sentience). Walden is a lilting jazz waltz that modulates to a variety of keys with intermediate modal sections -- this arrangement begins with the guitar solo, as a change of pace. Spirit Dance is an extended track (over 12 minutes) based mostly on a five-beat meter (interludes in 3 and 4), with extended modal jams on the 5-meter. (This is a layered meter with syncopated accents in the middle of the bar, as if a 2+3 type 5-8 meter were superposed over a 5-4 meter, providing a kind of rhythmic symmetry rather than the uneven 2+3 or 3+2 breakdown.) The treatment on this recording is more etherial and atmospheric than the Sentience version, and provides lots of room for the soloists to stretch out. Night Sea is a short latin-based head, evoking images of an ocean beach in a summer night. And Jewel is a gentle ballad anchored by lydian modes and smoky saxophone. * There are no overdubs on this recording. All compositions were arranged for live performance, and were performed as such in the studio. * The bass Dan plays is a five-string fretless "Buzz" bass made by M.V. Pedulla Guitars, strung with a high-C. The Buzz design includes a full 24-semitone range (two octaves) yielding a top note of C-above-middle-C. Because of the extended range and the chordal and melodic approach, Dan prefers to call this a "bass/baritone guitar" after the tradition of referring to classical male singers of intermediate range. * All synthesized sounds are produced by Rolf, with a MIDI hookup on his electric guitar. When guitar and synth are interposed, this represents a real-time sound change by Rolf during the live performance. * Percussion and drum-set are occasionally played simultaneously by Tom. Once again, this is live, not an overdub. I guess the best way to describe the music on this 30-minute cassette is to call it post-fusion jazz. With the exception of Mike Foster's tenor sax and Tom Nazziola's drums, the instruments are electric. Guitarist Rolf Sturm has come up with a couple of unique sounds via MIDI. But there are no unison lines snaking through abrupt time changes, no popping bass strings, no wimpy mellow-dees to waft your headaches away. No, this is real jazz. The rhythm section swings -- aggressively, if not deeply -- and everyone gets to stretch out some. In fact, the rhythm section is probably more energetic than the soloists, particularly Foster, who offers well thought-out lines and a somewhat Getzian tone to the proceedings. At one point, Nazziola and bassist Krimm solo simultaneously without getting in each other's way, demonstrating once again that in jazz the music's success depends as much on how well the musicians listen to each other as how well they play. A former bandmate of Stanley Jordan, Krimm extends the vocabulary of fusion bass on his five-string fretless (especially on "Spirit Dance," sounding uncannily like an upright bass). This half-hour EP includes four of Krimm's thoughtful compositions and also features guitarist Rolf Sturm (sounding like a mix of John Scofield and Bill Frisell) and soulful tenor saxist Mike Foster. This tasty offering should inspire big-label interest. For those of you not in the know, Time Jazz is a small club in the belly of the Time Cafe on the corner of Lafayette and Great Jones in the Village. As my companion and I went down the steps that lead to Time Jazz, the heartfelt melodies of the band could be heard. This night the club was showcasing the record release party of the Dan Krimm Ensemble's new album, Subtle Truth by Overtone Records, and was hosted by Carleton and Co., a PR firm in Manhattan. After apologizing for being late, not just fashionably late just late, to our hostess Christine, my companion and I seated ourselves to what would be an enjoyable hour of music. While sitting in our candle-lit booth and listening to Mr. Krimm attack the audience with his murderous bass chords, I stole a chance to let my eye wander through the club's intimate setting. The scarlet-clad room with its candled tables, muraled walls of Hispanic women dancing and playing pool and barmaids dressed in black, brought devilish thoughts to one's mind. A small stage is hardly visible above the floor with a red curtain as a backdrop. The whole room was in respectful silence, except for those few who walked in and out of the club, as Mr. Krimm and his ensemble played with an intensity that defied definition. His combination of fusion, mainstream and progressive jazz was masterfully accented by his four-piece ensemble. The ensemble, a group of down-home New York jazz musicians such as Mike Foster on Tenor Sax, Tom Nazziola on Drums/Percussion and Rolf Sturm on Guitar, is a lethal combination. Combined with Krimm's killer bass it will trap you in its sound and make you succumb to its will, and then pull you in for its slow merciless kill. After an hour of being insanely jealous of this man's bass playing (I've been a long-time admirer of the bass guitar and its players), I can truly say that Krimm has taken that instrument to uncharted regions of the music world. Krimm takes the bass away from the shadow of the guitar and into the light where it belongs, to cast a shadow of its own. I stole a chance to speak to Krimm, who has quickly become an idol of mine, and asked where else he would be playing. He said in the college circuit and the jazz clubs in and around NY. So look out for him, if and when he comes to Lehman's Concert Hall, and pick up Subtle Truth released on Krimm's very own record label Overtone Records. Following the release of his debut album "Sentience" to critical acclaim, bassist Dan Krimm has recently launched his second effort Subtle Truth (Overtone Records). Classically trained on the violin since the age of nine, Krimm picked up the electric bass in 1975. By 1978 his playing with a college schoolmate named Stanley Jordan established him as a rising talent. Krimm lists his principle jazz influences as Chick Corea and legendary bassist Jaco Pastoruis. "I realized this guy [Pastorius] had beat me by ten years, but technical standards are one thing and musical direction another... I got it into my head early that if I was going to do something original, it would be something that made more use of a musician's ability than playing technique." The Dan Krimm Ensemble features guitar, tenor sax, drums and bass. Mixing electric and acoustic instrumentation, Krimm and his group performed selections from the new album recently at the Time Cafe in NYC. Subtle Truth explores many different areas and styles of music, with one selection, "Spirit Dance," offering a distinct Eastern flavor. Taking a traditional backline instrument like the bass to lead strong compositional play, Krimm provides a bottom for the rest of the group to build on. Horn player Mike Foster explores a very melodic interplay with lead guitarist Rolf Sturm. I found it to be interesting and refreshing stuff. The drummer, Tom Nazziola, without piano accompaniment, provides strong tempo and drive. It reminded me of a Coltranesque sound: hard driving, yet offering great depth. Krimm's mixture of traditional and electric sounds is, all in all, a very enjoyable brew. Krimm shows ability to explore his instrument, but offers only a hint of what he is capable of: at one moment sounding like a guitar in the higher registers, then switching to a bass with deep melodic quality. Combined, this creates a very original conceptuality. I like the Dan Krimm Ensemble, and I'm sure you will also. The future looks extremely bright for this rising musical star. Understand this: I'm not necessarily a big fan of jazz. Last year I attended the JVC Jazz Concert at the Beacon Theater in Manhattan. Some of the music was enjoyable. Some I found completely uninteresting. I realized that the contemporary jazz scene is not simple at all. It has many different components, not all of which I like. When I bought Sting's 2-record set (recorded live in Paris), Bring On The Night, I was amazed at how much I liked the jazz-influenced music. Naturally, I wasn't quite sure what to expect when I picked up the latest from the Dan Krimm Ensemble, Subtle Truth (available from Overtone Records). Krimm's first album, Sentience, was released in 1986, and was partially funded by an NEA jazz fellowship grant. Subtle Truth is an aurally pleasant album of four fine extended tracks. The four-piece ensemble, consisting of Krimm on 5-string fretless bass guitar, Mike Foster on tenor saxophone, Tom Nazziola on drums/percussion, and Rolf Sturm on guitar/synthesizer, takes turns with thematically strong melodies when they are not all jamming together. My favorite track is Spirit Dance, which has all that I like in jazz: a strong underlying beat, a very strong thematic flow, and extended solos by each of the band members. Indeed, I could listen to this tune again and again, so pleasing is its sound. Not to say that the other tracks fall short. The three others, Walden, Night Sea, and Jewel are all fine compositions, each with a distinct theme and tone that is carried, developed, and intensified throughout the piece. Mike Foster is expressive on the saxophone, playing a flawless and important part in the fusion of the four component parts of the band. Rolf Sturm at times echoes Foster's saxophone on the synthesizer, making for a pleasing shadow effect. All in all, Subtle Truth serves to establish the Dan Krimm Ensemble as an important new jazz band. That is the truth, subtle or not.